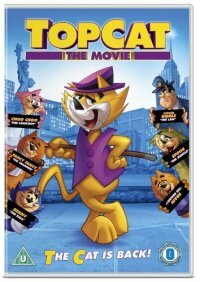 EOne is pleased to announce the DVD and Blu-ray family pack release of TOP CAT: THE MOVIE on Monday 15 October. Based on the much-loved Hanna-Barbera cartoon that has captivated the imagination of children and adults alike since it first appeared in the 1960s, TOP CAT: THE MOVIE brings the vibrancy, colour and retro charm of the original to a new generation and will amaze audiences young and old. After more than a 50-year hiatus, TC and his rap-trap feline gang return with ‘the most tip-top’ adventure that’s purrfect for all the family. With their wise-guy lifestyle hanging in the balance, TC and friends are forced to cash in on another of their nine lives to curtail Strickland’s reign of terror and claw their way back to the top! Joining old favourites TC, his tip-top gang and Officer Dibble, TOP CAT: THE MOVIE sees the welcome return of a host of lovable characters from the original Hanna-Barbera cartoon, including the fierytempered Griswald the Dog and the esteemed Maharaja of Pookajee. The voice-cast bring all the New York swagger of the original cartoon to this wonderfully mischievous feature-length adventure. TOP CAT and all related characters and elements are trademarks of and © Hanna-Barbera Productions, Inc.